Its that time again: Collect Weed Seeds for Herbicide Resistance Testing! It's that time again! 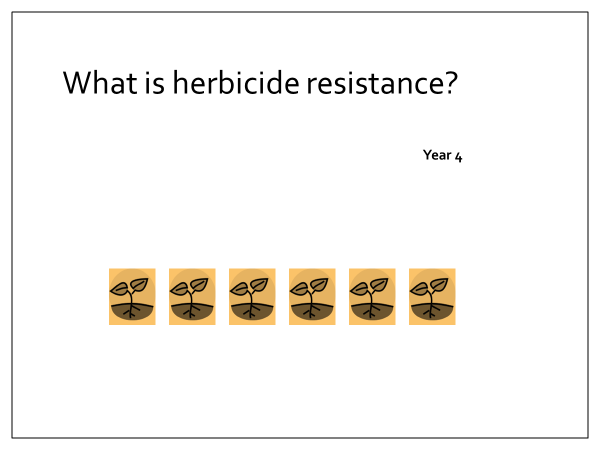 If you would like to submit seeds for herbicide resistance testing, many weed species will be maturing right about now. 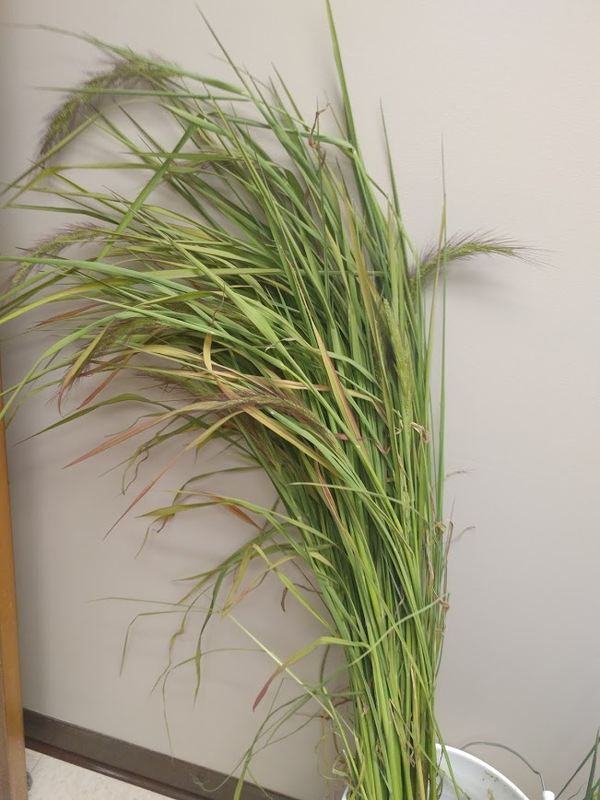 The UCCE Rice Weeds Program tests grower submitted seed samples of potentially herbicide resistant watergrass species, sprangletop, smallflower umbrella sedge and bulrush. However, we encourage you to submit ANY species that you suspect to be resistant. We keep individual grower information confidential and any reporting of results will not identify individual growers. Seed should be collected from areas that you know have been sprayed with the suspected herbicide. Collect seeds from multiple plants, and the amount should be at least a few handfuls of seed, to ensure sufficient quantity for testing. Please do not collect seed from around field margins. Allow seed to dry in the paper bag to prevent molding. Bring the sample and form to your local UCCE Farm Advisor or send or drop off samples at the Rice Experiment Station (RES) in Biggs. If you need assistance in collection, please contact your Farm Advisor or PCA. Results should be emailed to you in March of 2019. 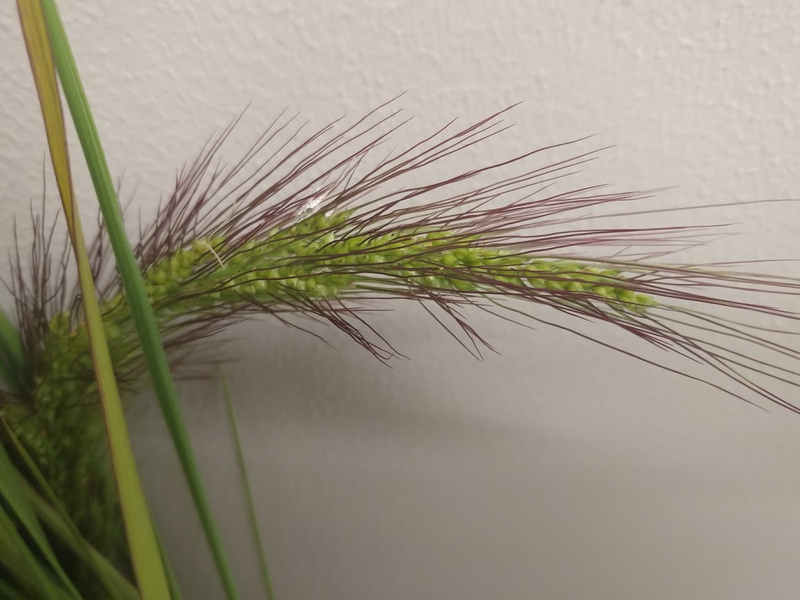 New Watergrass Species: be on the lookout for this weed! I have been to several farm calls in the past few weeks with this weed (pictured below). I have seen 7 fields between last year and this year that appear to have bad infestations of this new watergrass species (Echinochloa spp.). We are unsure of the exact identification yet, but we know it is in the watergrass family. The weed is maturing around mid- to late-July. It is small-seeded, and the awns are long and purple. All of the plants I have seen so far have seed heads that are completely awned, which makes it different than barnyardgrass (which has seed heads that are variably-awned). Please call Whitney Brim-Deforest (541-292-1553) or Luis Espino (530-635-6234), if you suspect that you have this weed in your field. We would like to collect seed samples to see what can be done to control it. Photo 1. Seed head of unknown watergrass species (Echinochloa spp.) Notice visible purple awns. Photo 2. Seed heads of unknown watergrass species (Echinochloa spp.) Notice visible purple awns, which can be seed before seeds are fully mature. Photo 3. Full plant sample of unknown watergrass species (Echinochloa spp.). This plant headed in late July. We talk about herbicide resistance all of the time in California rice. But how does it evolve in a field? 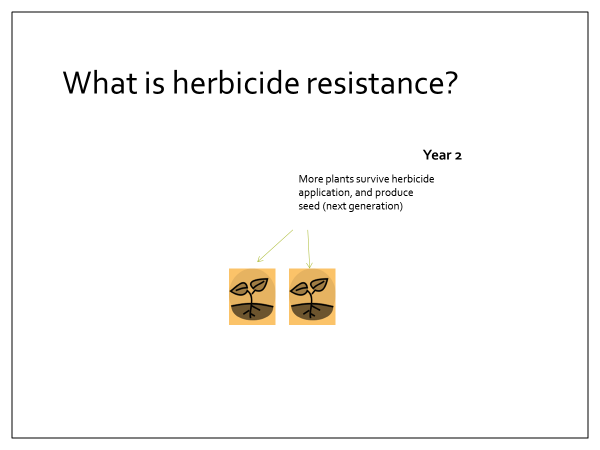 Understanding how herbicide management selects for resistant populations is an important part of preventing the problem from occuring in your fields. We have many weed species in CA rice that are confirmed to be herbicide resistant. 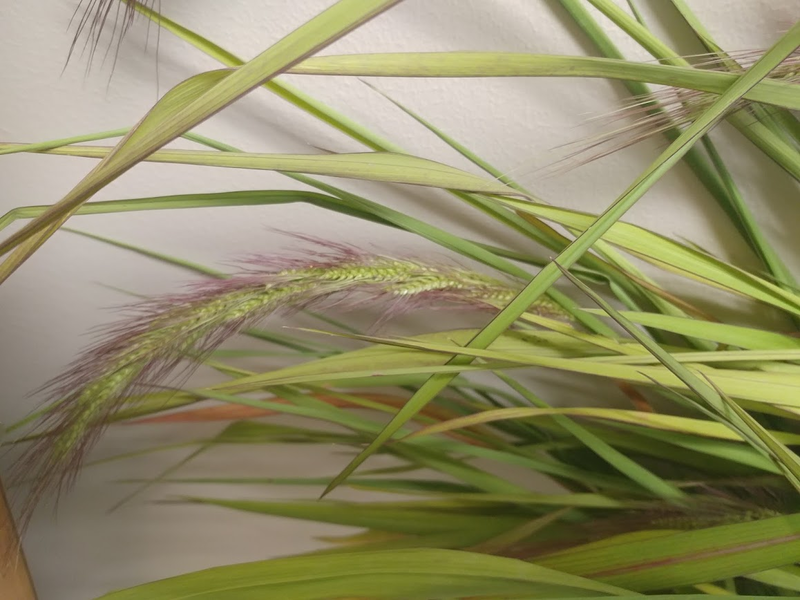 The major herbicide-resistant species are: late watergrass, early watergrass, barnyardgrass, smallflower umbrella sedge, ricefield bulrush (roughseed), sprangletop, and redstem. 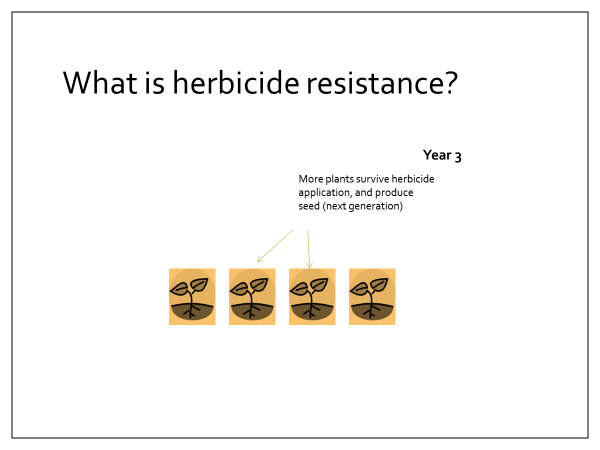 For this illustration of how herbicide resistance evolves in a field, we use redstem as our example. Year 1, Beginning of season: A population of redstem is found in a field and are emerging at the beginning of the season. 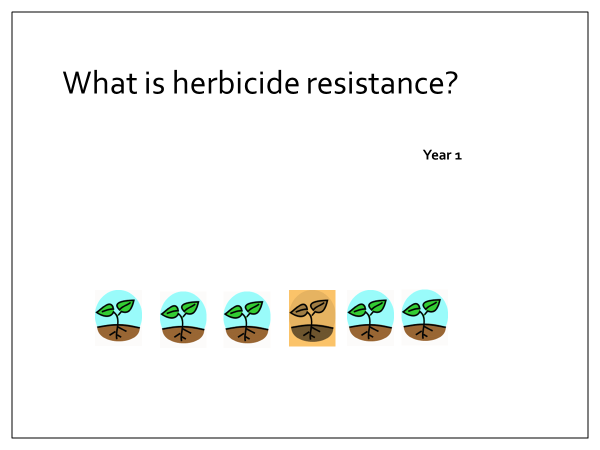 In this illustration, the plants with the blue background are naturally susceptible to an herbicide (Granite SC). The plants with the yellow background are naturally herbicide resistant to Granite SC. 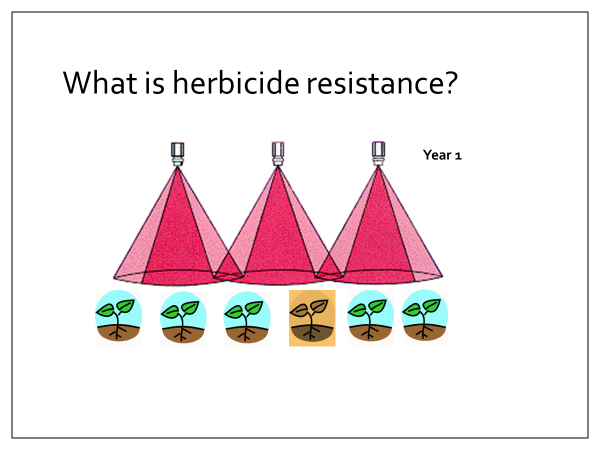 There is nothing that the grower has done at thispoint to select for resistance. The genes that make the plant resistant are naturally found in the redstem population in the field. Year 1, Mid-season: The grower applies Granite SC. Year 1, End of season: One herbicide resistant plant survives. This plant goes on to produce seed, and the seeds are deposited onto the soil surface, where they are tilled into the soil seedbank at the end of the season. Year 2, Beginning of season: The redstem population emerges from the soil at the beginning of the season. Because there are more seeds in the soil seedbank from the resistant plants, more of the emerged plants are resistant to Granite SC this year (yellow background = herbicide resistant). Year 2, Mid-season: The grower again applies Granite SC or another herbicide with the same mode of action (Regiment, Halomax/Sandea or Londax). Year 2, End of season: All of the herbicide resistant plants again survive the herbicide application. Again, they go on to produce seed, and the seeds are deposited onto the soil surface, where they are tilled into the soil seedbank. Year 3, Beginning of season: The redstem population emerges from the soil at the beginning of the season. 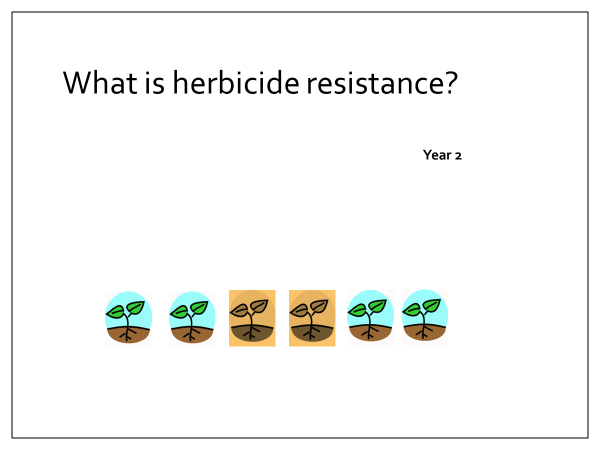 There are even more herbicide resistant plants than the previous 2 years, as the proportion of herbicide resistant seed in the soil has increased. Year 3, Mid-season: For the third year,the grower applies Granite SC or another herbicide with the same mode of action (Regiment, Halomax/Sandea or Londax). Year 3, End of season: All of the herbicide resistant plants again survive the herbicide application. Again, they go on to produce seed, and the seeds are deposited onto the soil surface, where they are tilled into the soil seedbank. Year 4, Beginning of season: The redstem population emerges from the soil at the beginning of the season. 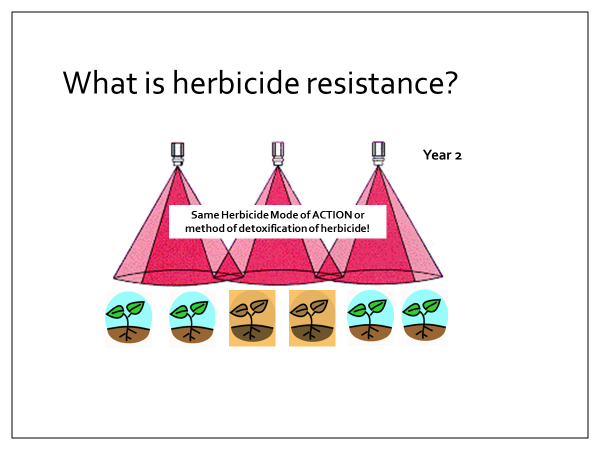 This year, all of the plants are herbicide resistant, as the soil seedbank contains mostly herbicide resistant redstem seed. The illustrations above are an example of how herbicide resistance evolves and is selected for in a field. A grower may not notice during the first year or two, as there are just a few plants that survive the herbicide applications. 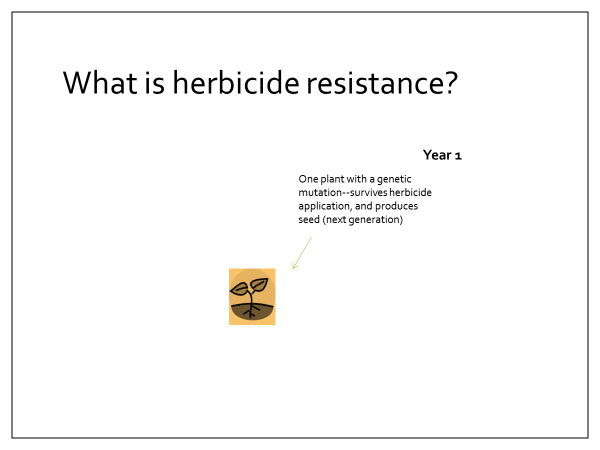 However, if the grower continues to use the same herbicide year after year, or the same herbicide mode of action, eventually, the population of redstem (or another weed species) will shift to become composed of only plants that are herbicide resistant. 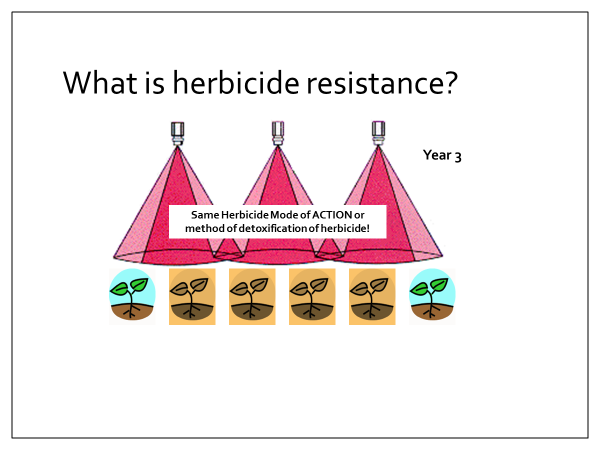 The best way to prevent the development of herbicide resistance is to rotate herbicide modes of action, both between seasons and within seasons. Refer to the UC Herbicide Susceptibility Chart for CA rice when planning an herbicide program.